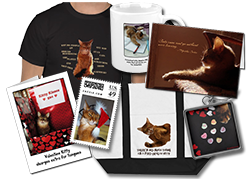 Kitties, you are going to want to show your humans this post because it is full of fun gifts for you! And even better, they are all made by friends of mine. I invite you to visit their shops and start making a wish list! Wouldn’t you love to wake up on Christmas morning with this festive toy to kick around? It’s from Bax Cat, whose Etsy store, Bax Cat and Co is loaded with fun nip toys (all made with certified organic catnip), cozy cat mats and even bandanas! This toy is called a Jellyfish, and aren’t you dying to attack all those tentacles? This toy comes from Feline O’ Mine and the human who runs it is also the assistant to my pals William, Russell, Caroline and Pee Queen! They have toys, cat quilts and even some items for your human. Their premium nip is grown in Canada! Your stocking will be stuffed to overflowing with this Holiday Cat Toy Gift Set from Moderncat Studios! I own several Moderncat toys and they are fun! Whether you want to give a toy a good kick or chase it around the house — or if you want a plush bed for post-play relaxation — Moderncat has it. And you get good feelings from these items that aren’t completely nip related — 5% of the total sales from this Etsy shop is donated to a different cat-related charity each month! Here’s something different to chase! These fun little speedsters will zip along any flat surface… until you pounce on them! If they hit a wall, they will just change direction and go on running! These awesome toys are from Baby Patches’ store, Nip and Bones! Since it is a full-service online shop, you will find all sorts of toys, treats, bed, scratchers, furniture and more! Your human can do some major holiday shopping for you here! Not only are these awesome shops run by friends, they are all small businesses, so please support them! We are going to sneak Mom’s plastic card! 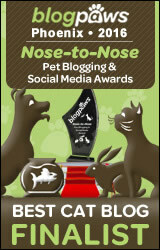 Sparkle, you were supposed to also be nominated by us for the Blog of the Year award. We have added you now. Yep, we just got the store back on line a bit ago–I was just about to change the message when I saw your note! Thanks for keeping an eye out! Oh my yes, that jellyfish looks like a real winner. My paws and claws are twitchin’ to get hold of THAT, lemme tell ya. Twitchin! Those are some really neat toys! We would love to play with them. Those are all great finds!!! I have the modern cat shaker and I LOVE it!!! OOOOOOOOOOOOOOOOOOOOH! I think that Jellyfish is swimming (crawlin’?) all the way to Dallas–it has MY name on it! Thanks for sharing with us, Ms. Sparkle! These are lots of toys!!!! MOM!!!! We want one of each plllllease! OH I love those. *looks over shoulder* MOMMY? My cats are too posh to play with these things ! they love real mousies, paper balls, old carton boxes, shoe laces, buttons, armchairs as scratching posts etc etc ..) ! Pawesome choices Sparkle! We spotted a package in the mail from Moderncat last week but maybe we can get some more packages coming here too! That jellyfish looks pawsome, but mom just ordered some toys from Moderncat for us so I don’t think I can talk her into a jellyfish, too. Tres cool! We totally needs to get our humans to begin thinking of US for a change! Oh, thank you for that wonderful highlight, Sparkle! We are still hoping that our store’s host will get their act together soon and cats will be able to order–our mom is having a complete bird and I’d say that host is toast. Ha ha ha! I made a rhyme! The Modern Cat toys I have don’t do anything for me but I got one of those electronic mice as a tester and LOVED it. Thanks for featuring all these fun gifts. Those look like some mighty fun toys. We will have to check them out. Thanks for all the info. Have a great day.